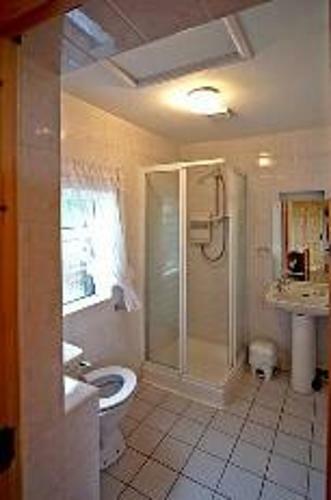 Spacious detached house (2000 sq ft) on elevated site with large balcony, it enjoys magnificent views over island studded Clew Bay to Croagh Patrick and the Connemara mountains in the distance. It is situated on a quiet county lane about 1½ miles from Mulranny village, with pubs and restaurants, sandy beaches and 9-hole links golf course. The village has a new 42km cycling/walking greenway from Westport to Achill, which is high up in the mountains and has spectacular views. Also within reach of four 18-hole golf courses. Achill Island (15 miles). Adventure centre (10 miles). Westport (16 miles). Garden furniture and barbecue. The house is well furnished and equipped on split levels with open plan kitchen, electric hob and oven, sitting room with open fire and French windows, dining room, utility room with washing machine/dryer, bathroom with bath, separate shower and W.C. Three bedrooms, one with a 5ft double and en suite shower and W.C., one with a double and en suite shower and W.C. and one with two singles. Oil fired central heating. Duvets. TV/DVD. CD/radio. Dishwasher. Freezer. Microwave. High chair & Cot on request. Hairdryer. This holiday home has comlimentary WIFI throughout. Utilities are charged at €65 this if for the oil and esb and is payable on site. Please note this holiday home is available to rent from Easter week up to 30th September and only weekly bookings are permitted starting on a Saturday.